When you were a kid did you collect Trolls? There was plenty to love about the little collectibles. They had the sweetest little faces, with their big beady eyes, wide noses, and wide smiles. All of these features displayed separately wouldn't be especially cute, but together they were perfectly adorable. No wonder most kids had an impulse to collect all of them from the doctor to the little guy in the Hawaiian shirt. And when they started putting jewels in their belly buttons? All bets were off! The beauty of the Troll costume is you can wear whatever costume you'd like and just add the Troll hair. You've got a nurse costume from two years ago? 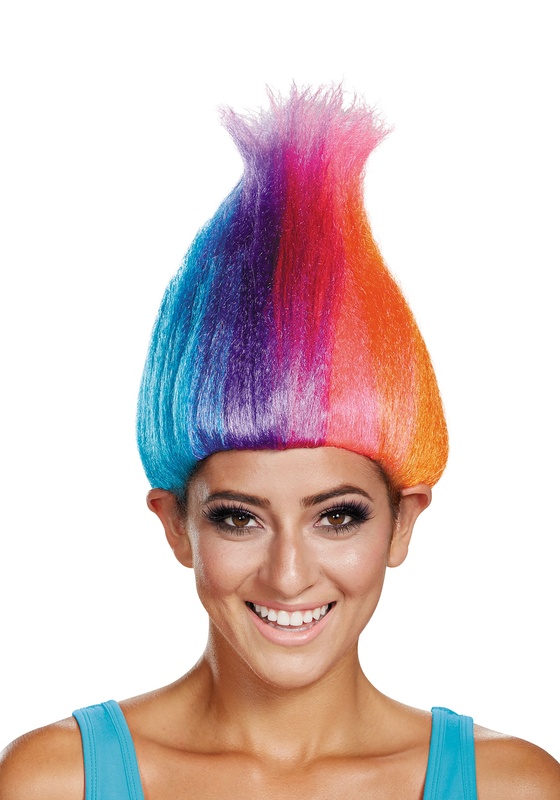 Slap that baby on and just add this colorful Troll wig and suddenly you're a 90's collectible classic. Honestly, as you go through your clothing your thematic choices are seemingly endless depending on the size of your wardrobe. With this funky fun wig you'll bring a big dose of nostalgia to any costume parties that you attend, whether or not you put a jewel in your belly button is up to you.